Back when DVDs were on the verge of appearing, rumours of the destructive qualities of lossy video compression were flowing. 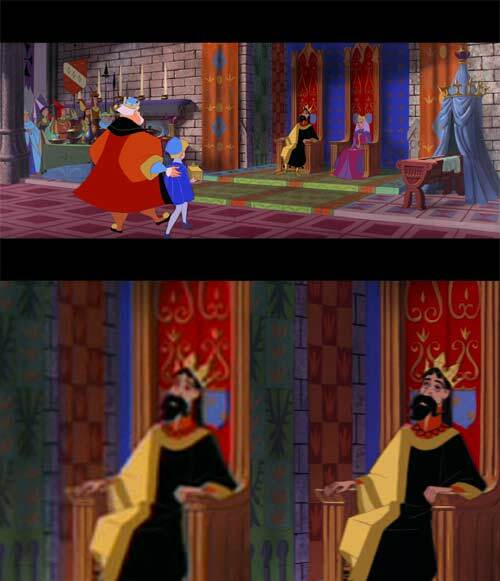 One of these was the claim that animation would look dreadful when rendered in MPEG2. As it happened, animation looked fine (when the disc was encoded competently). Especially traditional animation. Modern lossy video compression systems work in part by trying to eliminate redundancy (and near redundancy) not just within frames, but between them. 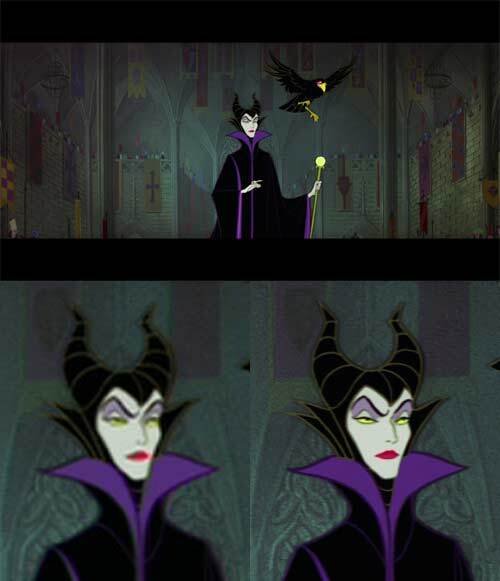 Since much of the action in hand-drawn animated movies takes place at 12 frames per second, rather than 24, it is actually quite easy to compress while retaining quality. 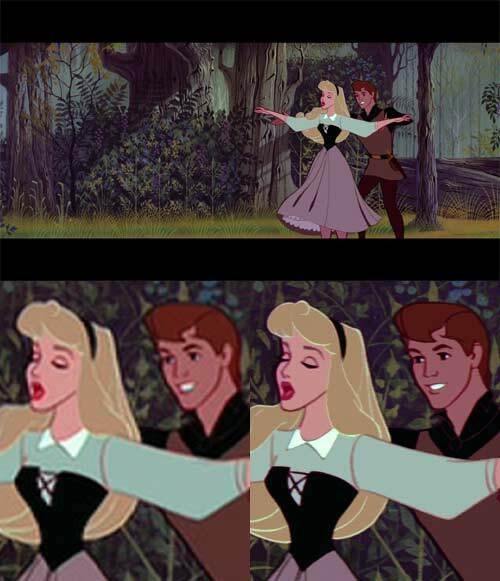 So when Walt Disney Studios delivered its 1959 classic Sleeping Beauty on Blu-ray with a healthy 24.06Mbps in the more efficient MPEG4 AVC codec, you can be confident that the picture quality would be about as good as it can get. Which is just as well, because the source film for this Blu-ray was shot in Technirama 70, Sequential Exposure. Basically, a 35mm film was run sideways through a large format film camera, providing much greater resolution. And the film was high quality monochrome, with each frame shot three times using red, green and blue colour filters. This meant that the Blu-ray could come from a freshly scanned (at 4,096 pixels wide) film, carefully restored and coloured. This also allowed the originally intended aspect ratio of 2.55:1 to be restored. The case says 2.39:1 but it is incorrect. The display area of the Blu-ray is 1920 x 752 pixels. The picture detail is extraordinary and the colours positively glow. This isn't a movie, it's a work of art. Disney also went back to the original three channel recordings, made in Germany, for the Tchaikovsky-based score. That meant a lot of listening to find the segments actually used, but they did it and mixed in cleaned up effects and voice. There is just occasionally a sense of sterility in the spoken voice hinting at the use of digital hiss removal, but I can live with that. The music could easily pass for something recorded in the early 70s. It's that good. Get this release before it goes back into the Disney vault for another seven years. Before getting to the DVD/Blu-ray comparisons, let us consider the two different DVD versions. I previously had in my DVD collection the 'Collector's Two Disc' DVD of this movie. This has THX certification and has the main feature with DTS 5.1 sound. Disc 1 carries ID number P04760/1, Disc 2: P04760/2. The 2-Disc Platinum Blu-ray version of this movie with which I was supplied is actually a three disc one. It also contains a DVD version of the movie as well, and this is drawn from the remaster upon which the Blu-ray was also based. The remaster is a work of art in itself and involved a huge amount of work, going back to the original 'successive exposure' film stock -- a black and white film in which each frame was photographed three times, once each through a red, a blue and a green filter, in succession. Amongst other things, the film was able to be presented in its original 2.55:1 aspect ratio as originally shot, rather than the 2.35:1 format in which it has since been presented (due to changing standards). All the detail on this restoration is laid out in this excellent interview by Robert Harris with Theo Gluck, the Director of Library Restoration and Preservation for Walt Disney Studios Motion Pictures. What follows now are comparisons between the new PAL DVD and the Blu-ray version of this movie. 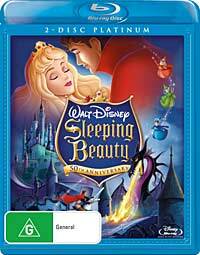 Both the DVD and the Blu-ray versions were from 2-Disc Platinum package provided to me by Disney. 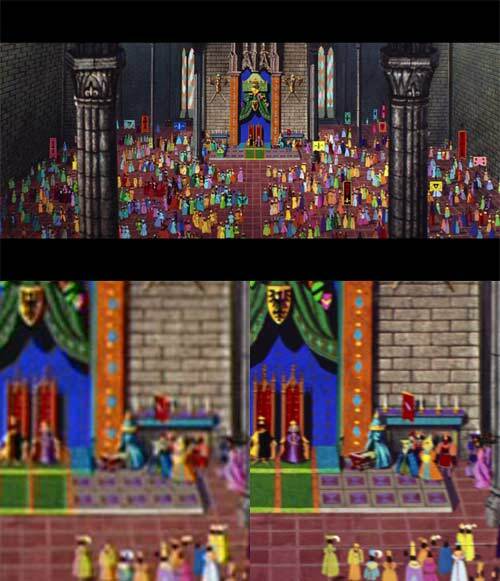 In the following examples, at the top of each is the full frame (suitably shrunk down) used in the comparison, with a 250 pixel wide detail from the frame underneath. The left side is from the PAL DVD. The image was captured digitally from the disc, scaled up from its native 720 by 576 resolution to 1,024 by 576 (to present in the 16:9 aspect ratio), and then, in order to be comparable to the Blu-ray version, from that to 1,920 by 1,080. The detail is from that last scaled version, and has not been rescaled again. The right side is from the Australian Blu-ray. This has not been scaled at all. 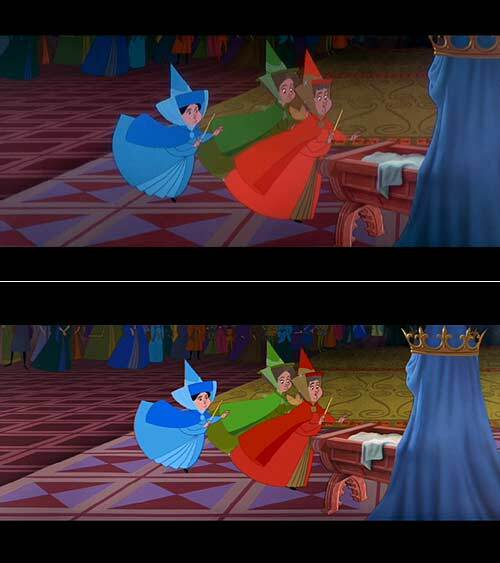 While the shot above shows more detail and cleaner edges from the Blu-ray compared to the DVD, the shot below shows how the lower resolution of the DVD can quite misrepresent things. 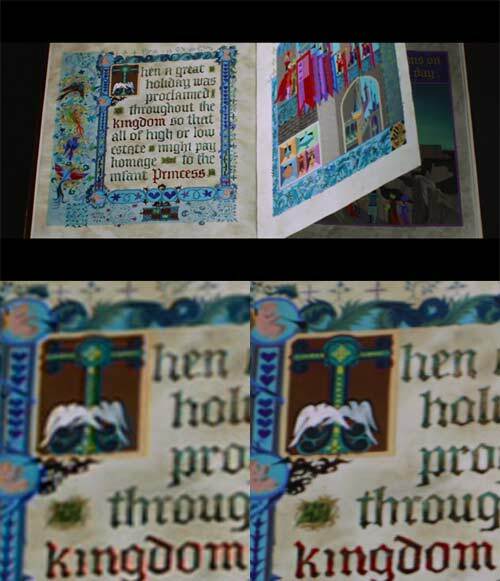 For example, in addition to being fuzzy, the stylised character in the crest at top left is distorted in the DVD. And how many candles are there on the table at the right of the shot?